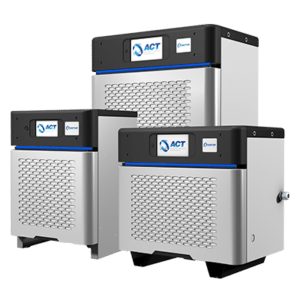 La Mirada, California — Advanced Charging Technologies, Inc. (ACT) recently announced the successful launch of its Quantum battery charger product line, with nearly 3,000 Quantum chargers having shipped to customers since the product launch in March 2016. “This is a true testimonial of the success of the Quantum product line. Our engineering team, led by Dr. Nasser Kutkut, has designed and developed one of the most advanced industrial battery charging technologies to date, which is already molding the industry,” comments ACT CEO, Bob Istwan. The new Quantum chargers feature modular technology, built-in redundancy, plug-n-play operation, and scalability through field expansion, collectively providing the highest reliability in industrial charger technology. Serviceability is simplified and service time is greatly reduced by the reduced number of serviceable parts with fast and user-friendly access to all assemblies. Quantum chargers are highly energy efficient— resulting in reduced power consumption and energy costs— with peak efficiencies greater than 94 percent and full-cycle efficiencies greater than 93 percent. The most intelligent chargers in the industry, Quantum chargers are equipped with wireless communications, allowing for wireless cloud integration as well as remote monitoring and control. The chargers are also equipped with power line communication (PLC), enabling direct communication with BATTView battery monitors via the charging cables, eliminating the need for auxiliary cables and more expensive connectors with auxiliary contacts.